Will Narendra Modi Be Next Prime Minister of India ? 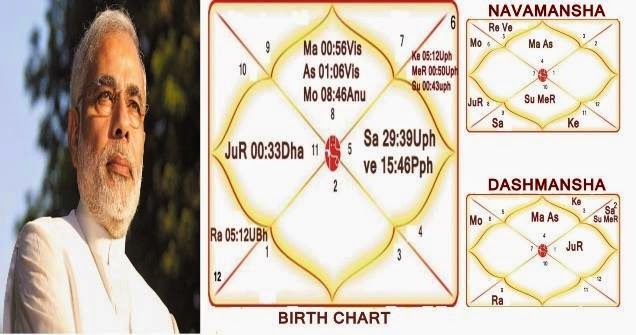 Narendra Modi is born with Scorpio lagna and 9th lord Moon is also in Lagna with Mars.Lagna Degree is about 5 Degree quite indicating Young, talented, youthful and dynamic personality. In Lagan, Mars (Lagna Lord) and Moon (9th Lord) Forming Ruchuka-Mahaprush yoga clearly indicates naturally born leader who is daring, bold with enterprising quality and willing to cross any hurdles, can overcome any battle with his strong will and intellectual power. All these qualities Making him Naturally born leader and giving him conquering capabilities those similar to look alike Sikander (Alexandra the Great). Ruchaka yoga is considered as an one of the five Royal Yogas in Vedic Astrology and falls in category of the Panch MahaPurusha Yogas. With this Ruchka mahaprusha yoga, Neech-bhagna Yoga also forming in lagana too giving extra Strength back to Moon as well but placement of weak mars in D9 chart, some how nullifying the excellent result of Mars. Usually with these types of combination native may have to face Great fall after great rise or in those vice-versa conditions.Currently Modi ji is having moon Mahadasha, Nakshtra lord is Saturn Placed in the 10th house with Venus forming a Vosi Yoga creating naturally acquired Name & fame in its social or work life without any more efforts, natives usually born in this yoga act like a natural Human resource manager or apt in social management , a great social personality, a reformer and most important making him great level of charitable human being. Saturn is also (AK) Atmakarka too which also means a person born with natural quality for helping down trodden people and great rise after lots of struggle in life. Aatmakarka in 10th house in D1 Making him Natural Karam Yogi Born for Fulfilling its duty toward Social reform and raising the bar of mankind. , that’s why modi ji always ready to help those people who are in great trouble to raise their bar and very popular in weak society masses and also giving qualities of natural Management and expert dealing in social masses. Currently Modi ji is Facing Sade-sati from his Moon sign and lagna too and Rahu also joined with Saturn In his 12th house from Lagna as well as from Moon , only hurdle in achieving success in ministry as it indicates person has to work hard to earn name in the society and have to face false and dirty political traps. The Trap Combination of Rahu with Sat in its 12th from Moon and Lagna chart giving him lots of physical distress as well as Acute mental troubles due to enemic acts by opponents.Reason being Rahu and Sat both are Karka for 4th house wrt to Modi ji Lagna kundli and Moon Kundli , natural karka for Peace , home and Mind and thoughts so this combination clearly imbalanced all the qualities of 4th house. Here Saturn is teaching him the lesson of social relationships, how to balance social relationships and telling him who is with him and who is not with him so that in near future he is able to handle himself in all odd conditions. This is the only hurdle what my analysis telling me and modi ji have to face all this Due to oppositions dirty traps ,conflicts and Blame games etc etc all due to Rahu & Shani Kroor Yukti in 12th from his Moon sign and which keep disturbing him from few years( Started from 2011 nov -Saturn & after dec 2012 -Rahu).Reason Being is Rahu is an expert in diabolic qualities , manipulative game plannings & being cheat nature and here Rahu is completely Merge up with Saturn and keep disturbing him for doing his free work but Soon condition gone change after July 13 2014 when Rahu will move into the Next powerful sign of Virgo in Lagna as well as in moon kundli. That time Rahu will be in his Friend house sign and will give him huge amount of gain and power through the Social environment which he will make to get work done.11th house is the natural house of Social network and making alliances with your Social circle you have in your environment so you will see after july 2013 a great friendly alliance going to be happen. From Modi ji Moon sign and lagna chart Rahu will be in 11th house after 13th july 2013 and which clearly shows huge gain over enemies and Getting in power and Forming new alliances with many friends. Reason being Rahu Antar dasha is going on and Rahu is Modi AMK (Amtya karka) forming a Raja Sambhanha yoga which simply means a Famous Minister known for his good deeds and intellectual knowledge’s. From 26th April 2013 and Modi having highest order of Fame yoga (Rahu in 5th house in Satvic sign of pisces – giving him Good level of Intuitive power, Sharp Mind and well versed in speculative works and a imaginative planning ) in Lagna kundli but due to Rahu basic nature of False image deployment , Modi ji also facing lots of social conflicts, blames and opponents Issues regarding conspiracies and traps implemented by opponents and in his own BJP camps( Rahu is in 9th from Al – Modi own member Betray him and leave his Companies ) but everything gone useless due to Modi other beneficial yoga’s in kundli. Moreover Rahu is also Amatya-karka and in 5th house of Natural sign of name and fame and Social and political house ( A minister or an Imp person in a Kingdom) for Modi ji and placed in trikona which clearly indicates A famous Minister and will shine as a great personality as a politician. Rahu is Seen for Success in Political careers and Providing Name and fame to the native and in 5th it Gives Huge and massive Fame & Rahu is very powerful For modi ji reason being Rahu is an Amatya karka and in trine too, lord of kendra and also in trikona house which making him very much skilled ,technically very sharp minded and creative too and will give him huge and massive fame in all sort of creative work for growth and development, these types of combinations are seen in very technocrat people who are very well versed in IT Technologies. As Same things is seen from 9th from Al ( Outer perceptions of what other people think on our self) Making him Very much skilled and knowledgeable and Same is seen from 9th from Karkamsa where Rahu and Venus Present making Modi ji naturally creative(With Planet of creativity- Venus) ,Very much skilled in Political and Technical stuffs. I can say a natural Skilled and creative person born with Great Social and Political knowledge. If we See his D9 chart ,10th house from Karkamsa (saturn) Moon is there which clearly indicates A man with natural leadership quality born to help Society and raise the level of Society, making him a natural Social leader who can Move large number of mass by his social nature and oratory abilities. That’s why after Starting of Rahu antardasha from april 2013 Modi Ji natrual name and Fame increased suddenly but due to rahu diabolical nature Modi ji also have to face lots of false accusation from oppositions too. Same for mars is also there who is 10th lord from Arudha lagna (AL) and present in 5th from it with Arudha lagna lord which clearly telling me A Bold & courageous man born with self-dependent qualities who can shake anyone with his strong dedication, courage , will power & with strong mind power ,that’s why Modi ji is very much Strong In his view point and its not easy for anyone to break his Strong will power to force him to step back once he decides. Jupiter is 6th from AL making him a satvic nature person believes in helping and guiding people. exalted Position and for Modi ji Guru will be in 9th house from Lagna as well as from Moon sign and also aspects Mars and moon too who is also 9th lord as well as AL lord , and Mahadasha lord too – or you can say lord of luck and Main advisory(Mantri) to the kingdom(India) or an important person in Kingdom to the King ( which we called as Prime minister in Poltical terms in Current time in politics ) in Lagna kundli. This Combination clearly depicting high order of Ministerial power and modi ji can be in charge of handling big Ventures in Central Ministry or in the ” KINGDOM of INDIA “For Fulfilling this job Modi ji has to face lots of False accusation from opponents till 15th july 2014 but once Rahu move from libra to Virgo MOdi ji will again get boost in his name, fame, power and strength and will start his work with full force. Current Planetary Placements of Jupiter making Modi expert in his oratory skills by aspecting 2nd house from 8th house from Scorpio moon sign and Rahu in libra giving Him lots of mental troubles from others( Hidden conspiracies from others seen from 12th house )in his mind to break his will power and mental strength which they are not able to succeed as Jupiter also aspecting Same by Gemini sign so modi ji facing it all and same time defeating all hurdles given by opponents with his strong will power and expert planning and Strategy. After October 2014 Guru Dasha will come and modi ji will do lots of Social work in society in his ministry as Jupiter will transit in D10 lagna chart too in Mars in cancer sign and will be 9th from AL ,which clearly means performing lots of social and religious work in the society. Rest Only God knows what will May bring to the Future of India but i believe Modi ji will be in Full Power after june 2014.